wanted to differentiate the activities on the ground from the financial system in the stock market so coined the term 'Real Economy' as - Letter 2.
calculated the Malaysian Ringgit to stablize at RM3.80 to US$1 - Letter 4.
advised that the price of proton cars should be lowered by 15% to 20% to initiate Demand for cars and get the economy moving again - Letter 3.
asked the government to increase the period before a loan was classified as a Non Performing Loan (NPL). At the time of writting I thought that this period should be increased from 3 months to 2 years. 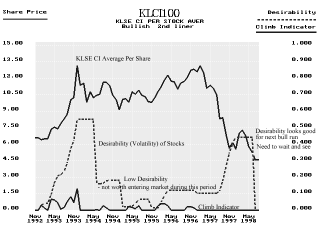 explained that the banks should bring the interest rates down as they were too high and high interest rates would only create more business failures which would result in a further collapse of the economy - Letter 4 & Letter 2.
published, in August 1998, a chart predicting the KLSE Bull Run until 2001. This is the first public demonstration that commodity and stock markets trends could be predicted by upto atleast 2 years ahead - Letter 7.
had an error in Letter 10 but I have corrected for this in my Doctoral Thesis. published the prediction for the Nikkei 225 - Letter 9. Showed how D(z) compensator could defend a stock exchange against vicious attacks by speculators - Letter 10.
explained that money is like water - this is a very important concept. Wherever the river flows plants flourish like wise wherever money flows businesses & plants (factories) flourish. An arid land is not productive or fertile as nothing can grow on it. Without the availability of water plants cannot flourish likewise money has to be avaible to keep Demand going so that the economy can flourish and prosper - Letter 2. These letters were probably the reason Malaysia did not need IMF help. Worst still the IMF was proposing increasing interest rates which would have destroyed the economy. By the way my letters were photocopied and circulated to many people. I know this because I met people who could quote my letters. By 2000 or 2001 my PC hard disk crashed and I lost a lot of work. I do not know if I lost other letters to the Prime Minister. The letters that I have reproduced here are those that I managed to recover from the crashed hard disk. The rest is history. This article was written by Dr.Peter Achutha on 1st January 2018.